When Women for Women International and Gender Action for Peace and Security approached the Centre for Women, Peace and Security regarding a research project on the impact of conflict-related displacement on women’s economic empowerment and livelihood needs and opportunities, it was the beginning of a great partnership. This partnership has culminated in a research report and series of policy recommendations drawing on the voices and experiences of displaced women in the Kurdistan Region of Iraq (KRI). This research is the outcome of in-depth and extensive fieldwork in the KRI. We talked to more than 130 displaced women through interviews and focus groups, as well as to a small number of host community members and more than 20 practitioners, experts and officials. We interviewed internally displaced persons (IDPs) and refugees, located both in camps and outside the camps in all three governorates of the Kurdistan region: Erbil, Sulaimaniyah and Dohuk. We tried to ensure that participants were as diverse a group as possible including women from rural and urban areas in Iraq and Syria, from different ethnic and religious backgrounds, different ages groups and with different experiences of livelihood engagement, or no engagement at all. The research led to a range of findings, all documented in detail in the report. Here I will summarise only the most important findings, which does not do full justice to the rich insights women shared with us. The research showed that displacement increased women’s engagement in livelihood activities. Families depleted their resources for survival, got huge loans, and it became harder to earn a living due to a lack of jobs (or low income jobs), an inability to work due to health or other reasons, or absences (or death) of men in families. In these circumstances, several women were forced to work. Firstly, most of the participants find the livelihood support they receive beneficial, such as training in sewing and hairdressing, provision of start-up kits or loans to start a business, working at NGOs, and so on. But they do not see this support and the kind of activities it promotes as evolving into sustainable income generating activities. This is mainly because most livelihood programmes focus on non-productive and low-income activities; there is a lack of continuing support; the one-size fits all approach adopted in programming does not cater to a relevant market or does not take into account women’s needs and their circumstances. How can we empower women in conflict prevention? The wider economic context in the KRI and the economic crisis since 2014 also hinders these livelihood activities from turning into viable and sustainable income generation. Displaced women who opened shops or hairdressing businesses initially were doing better but now their income has significantly reduced or they had to close their businesses. Moreover, women face several restrictions to their mobility and they have concerns about their safety when they leave their home, tent or camp. They also have heavy responsibilities at home, which are exacerbated by poor infrastructure (water, electricity, distance to drinking water spots) in their living conditions. Having to work increases their burden. Second, there is huge variation in women’s experiences of displacement, their livelihood needs and access to economic opportunities, and this variation needs to be reflected in programming. For instance, livelihood engagement as well as educational attainment is more common among Syrian women than Iraqi IDPs. Rules for work permits for IDPs and refugees are different; it is easier for refugees to work in the KRI. Syrian refugee women find the societal norms in the KRI with regards to women’s roles in family and public and women’s mobility more restraining than in Syria. Almost all Syrian women said they experience harassment in public. Displaced women also have different experiences of livelihood engagement depending on whether they come from urban or rural areas. Most IDPs and refugees who used to live in rural areas have limited or no education and many of them are illiterate, whereas those with urban backgrounds are more likely to work in displacement. Rural IDPs and refugees are more likely to settle in camps because of relative poverty and fewer connections in cities to help them navigate their settlement. Place of settlement affects women’s livelihood experiences. It is easier for women living in towns to find a job and work, whereas camps are outside towns and cities and transport is not always available or cheap. This is a particularly important obstacle for camp-resident women’s ability to work outside the camp. Family circumstances also have defining roles. Women in female-led households have the most challenging livelihood deprivation situation, as it is particularly hard for them to earn a living and look after their family at the same time. They face societal stigma for being a widow therefore are judged harshly for leaving their home. Ethnic and linguistic background is another factor that differentiates displaced women’s experiences of livelihood engagement. Syrian Kurdish refugees feel more welcome in the KRI and it is easier for them to find a job than Arabic speaking IDPs. There are also differences between Arab and Yazidi female IDPs, despite having similar rural backgrounds. 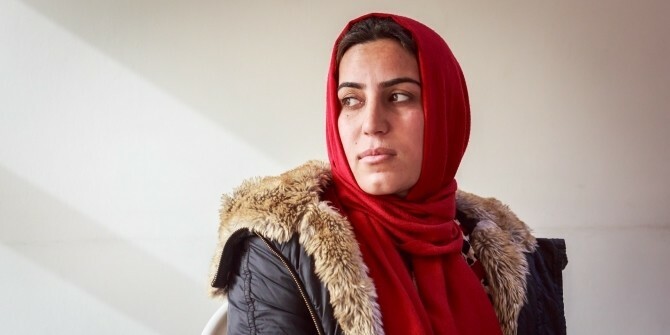 Yazidi women are more likely to be open to attending awareness-raising and training sessions and are more interested in pursuing livelihood activities. These differences need to be taken into account in programming and this should be done without gender stereotyping and strictly categorising women based on communal, cultural or age identifiers. Moreover, not all women we spoke to fit into these generalisations, and there were notable exceptions. Third, there is no question that there is a window of opportunity right now in the KRI to further support displaced women’s engagement in livelihood activities and to support their economic empowerment. Displacement and conflict changed the economic and social circumstances of families and communities and created both opportunities and obstacles for women’s engagement in livelihood activities. The economic burden, husbands’ or other male family members’ inability to work or earn enough income, depletion of savings or resources created a space for women to engage in livelihood generation. However, this has been mostly out of necessity. There are small positive signs of changing mindsets and attitudes among men when it comes to women’s role; for instance, study participants among the Yazidi community mentioned the decreasing restrictions on their mobility and girls’ school attendance. However, almost all study participants expressed their reservations about the extent to which current changes in their situation will lead to real change. For change to be sustainable and lead to women’s economic empowerment, a holistic approach should be adopted to create transformative change. Transformative change is essential and requires long-term and sustained improvements not only in the economic context but also in non-economic aspects of women’s lives, such as increasing the literacy rate, including their legal and political literacy among many other factors. There are structural obstacles that limit women’s ability to be more mobile and have access to opportunities. Women’s livelihood needs intersect with their other needs, such as representation, legal support, protection from violence, safe spaces, and health support (both physical and psychological). Adopting a holistic approach to supporting women’s economic empowerment and responding to their livelihood needs is essential to generate meaningful and transformative change.